[Update February 14, 2017] Once again supportive Glendale responds to call to action against the dog meat trade. Home / Blog / [Update February 14, 2017] Once again supportive Glendale responds to call to action against the dog meat trade. Previously, the former Mayor of Glendale, and the current City Councilman, Mr. Zareh Sinanyan, reached out to Gimpo calling for action to enforce the law. Glendale is also the first city ever, as a result of our many Sister City/State campaigns and petitions, to kindly respond to us by taking positive action. We are very grateful to Mayor Paula Devine and the entire City Council of Glendale for caring about the poor Korean dogs and taking action to speak out for them. We are also thankful to all in support of our work, who have taken action to speak out against the cruelty to dogs and cats in Gimpo. Please send an email thanking the Mayor and the City of Glendale for responding to our concern. You can use our suggested message below or your own words. We would like to thank you and the City of Glendale for once again responding to our concerns raised through the petition on Change.org about the mistreatment, torture and consumption of companion animals in Glendale’s Sister City, Gimpo. Both domestic and international pressure on this issue is required if we are going to incite some real change in South Korea, so I kindly urge that you continue to reach out to Gimpo until affirmative action has been taken by their authorities to end the horrific and illegal practice of the dog and cat meat trade for good. Thank you again for your efforts here. Video: KARA. This massive dog farm in Gimpo, Korea, slaughters dogs by hanging them inside their cages to save on electricity while other dogs watch in horror. Video: KARA. Dog farm with more than 2,000 “meat dogs” in in Gimpo, South Korea. Thankyou for your kind support of the outrage towards innocent animals.There is torture and barbaric actions towards animals in eastern countrys. Yes – 100% agree.Stop it now!!! Please help the dogs to end this evil doge meat trade .. thank you they have no voice innocent souls ?? Thank you so much for your work in helping to stop the Brutality of the dog and cat horror these animal suffer in appaulling conditions and the torture is Horrendous no animal should suffer the brutality they do not deserve to be treated in such a way thank you so much for your support . Thankyou for helping the dogs. This cruel barbarity has to stop. The butchering, boiling, hanging and skinning alive is cruelty beyond belief. Thank you for helping the dogs, we need to stop cruelty, it is heartbreak. we are moving slowly but in the right direction !!! we have a long way yet to do but I hope to be still alive to see this horrendous trade banned !! I can’t handle what these cruel people do to these poor dogs and cats…….I sign every damn petition there is out there to save any animal from these people or any other person around the world who is cruel to animals…UNCALLED FOR…. the words that want to come out won’t be allowed on here!!!!! Thank you for speaking against the torturing and slaughter of man’s best friends and of course the cats. Please do all that you can to stop bring an end to this horror to these animals. Thank you for your help-people like you will make the world a better place also for animals who are so close to my heart-all politicians should be like you. Letter sent. Thank you so much for your work. I will donate as much as I can when I can. Thank you, Mayor Devine, for supporting our ban against the dog Meat Trade. Thank you for helping the animals. I can’t stand even thinking about what they do to these poor beings. I’ve signed so many petitions I’ve lost count!! You are beautiful, inside and out! Thank you for your courage to take the steps to ending this horror for these poor dogs and cats. There is absolutely no excuse for making any living being suffer like this. Thank you for your all you are doing to stop this unacceptable cruelty. Thank you so much for taking action to stop the unthinkable dog and cat meat tradition in Korea. It’s hard to believe that the government allows such cruelty so it is up to individuals to put pressure on them to put an end to this atrocity. Enough with killing animals. We have endless options to replace meat and its properties. Let’s leave animals, beings with feelings and a heart of their own, lead a happy and fair life. Thank You so much for keeping this good work up! God bless You and everyone who speaks up for the animals! 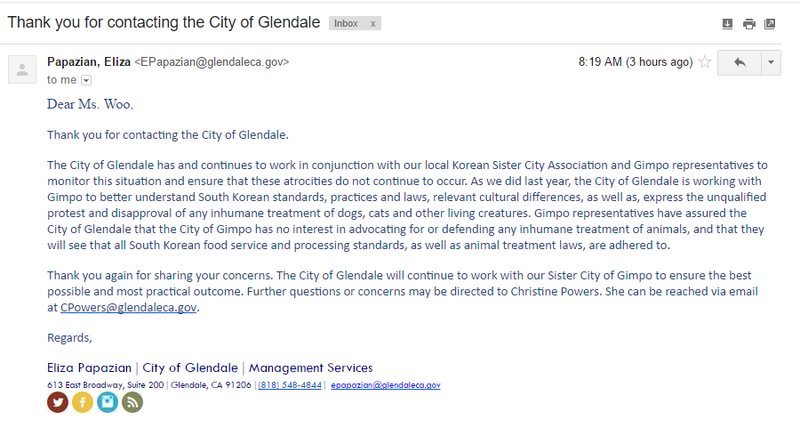 Many thanks to you and the City of Glendale for once again responding to our concerns raised through the petition on Change.org about the mistreatment, torture and consumption of companion animals in Glendale’s Sister City, Gimpo. Both domestic and international pressure on this issue is required if we are going to incite some real change in South Korea, so I kindly urge that you continue to reach out to Gimpo until affirmative action has been taken by their authorities to end the horrific and illegal practice of the dog and cat meat trade for good. God bless you and your team.